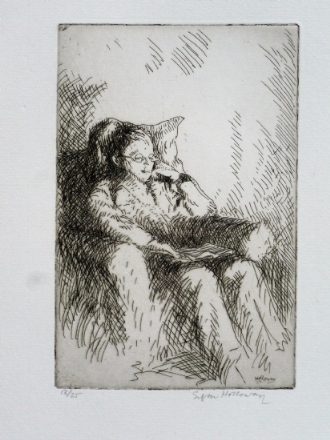 Signed etching, 1932, plate size 15cm x 10cm plus full borders. Edgar Holloway, born in Doncaster in 1914 left school at fourteen, declining an offer to go to art school full time in favour of travelling the Yorkshire countryside in pursuit of suitable subjects for watercolours and drypoints to sell through his father’s picture-framing shop. His reputation was established when he was given his first solo exhibition at the Twenty One Gallery off Regent Street, to critical acclaim. At the same time his work entered public collections like the British Museum and the Victoria and Albert Museum. 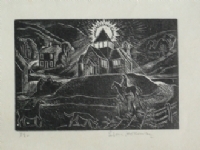 Holloway’s marriage in 1943 to Daisy Monica Hawkins, a former model to Eric Gill, was inspiring in his developing interest in the work of Gill and particularly his attitude towards fine art and craft. 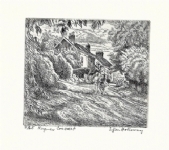 Holloway lived with his young family in Yorkshire, then in Capel-y-ffin in the Black Mountains, and from 1949 on Ditchling Common, accepting an invitation to join the Guild of St Joseph and St Dominic. 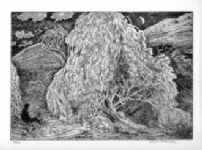 Holloway did not return to printmaking until he gave up commercial art in 1969. The romantic, plein-air responses to the Yorkshire landscape of Holloway’s early drypoints, and his exact recording of architectural subjects, eventually gave way to a more sophisticated and expressive visual language. Holloway died in 2008.